Cross-frequency couplings between oscillatory modes have been observed in cortical and hippocampal local field potentials recorded from the brains of rodents, primates and humans. Multi-unit activity recordings have shown that the highest amplitude of gamma and theta oscillations occur at the rising positive going part of theta and delta oscillations, respectively. We show that a network of leaky integrate-and-fire neurons with short term plasticity between pyramidal cells and interneurons can exhibit a similar oscillatory hierarchy (see Figure 1). Moreover, the network exhibits alpha oscillations which amplitude is modulated by the phase of delta oscillations. There is no phase-amplitude coupling between alpha and theta. Finally, these oscillations are nested in a slower 0.2 Hz oscillation. We study the mechanisms of these oscillatory patterns reminiscent of spontaneous cortical activity. Simulation in a network composed of 8000 pyramidal cells and 2000 interneurons. (A) Firing rates of pyramidal cells νE and interneurons νI in red and blue, respectively, smoothen within a window of 25 ms duration. The frequency of slow oscillations is approximately 0.2 Hz. 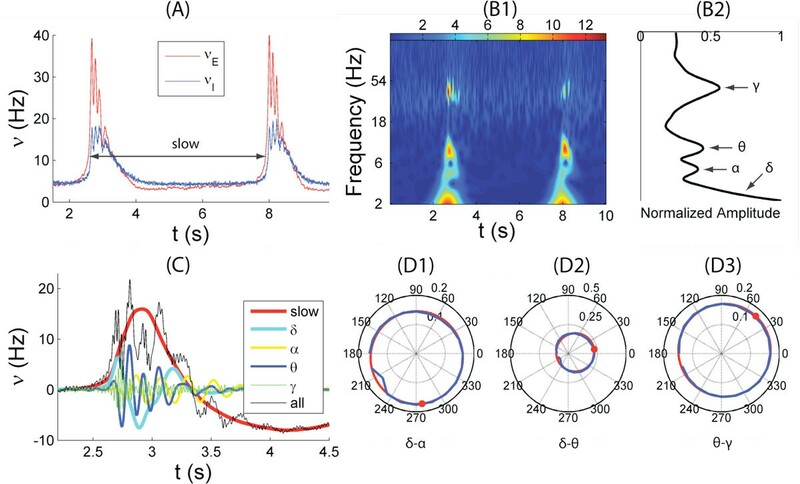 (B1) Continuous wavelet transform of the firing rate νI using Morlet wavelets. The color scale represents the energy for each coefficient of the wavelet decomposition (arbitrary scale). (B2) Normalized cumulated energy for frequencies shown in (B1). (C) Firing rate after applying a band pass filter around frequencies corresponding to slow, δ, α, θ, and γ, respectively. (D1-D3) Cross-frequency coupling between two oscillatory modes f1 and f2 represented in polar coordinates. Radius and angle are the normalized average amplitude of f2 and phase of f1, respectively, obtained from the wavelet decomposition (method adapted from ). The blue line is the distribution calculated from the simulation of leaky integrate-and-fire neurons. The red line is the fitted von Mises distribution and red dot the phase of f1 corresponding to the maximal average amplitude of f2. (D1) f1 = δ, f2 = α. (D2) f1 = δ, f2 = θ. (D3) f1 = θ, f2 = γ. This research is supported by the the Aihara Innovative Mathematical Modelling Project, the Japan Society for the Promotion of Science (JSPS) through the "Funding Program for World-Leading Innovative R&D on Science and Technology (FIRST Program)," initiated by the Council for Science and Technology Policy (CSTP).